He’s Clinched the Nomination - Can Trump Take the Presidency? Republican presidential nominee Donald Trump speaks during the final session of the Republican National Convention in Cleveland, Ohio, July 21, 2016. Thirteen months after announcing his U.S. presidential bid, Donald Trump took to the stage in Cleveland, Ohio to utter the words that launched his unprecedented campaign. It’s this promise that drove millions of Republicans to the polls during the primary and brought Trump the Republican nomination this week. 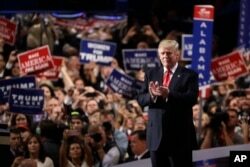 “Together, we will lead our party back to the White House, and we will lead our country back to safety, prosperity and peace,” Trump told Republican delegates in his acceptance speech late Thursday. Republican presidential candidate Donald Trump takes the stage during the final day of the Republican National Convention in Cleveland, July 21, 2016. The businessman’s ability to tap into the national mood of what some say is a divided country could make it a close race between Trump and presumptive Democratic nominee Hillary Clinton, says American Enterprise Institute senior fellow Karlyn Bowman. And Trump has certainly shaken up the race for American president. Since announcing his decision to run, Trump has called for a temporary ban on Muslims entering the country and praised the leadership of Iraq’s Saddam Hussein. Instead of torpedoing his campaign, the controversial comments have only seemed to bolster support for the Republican candidate. 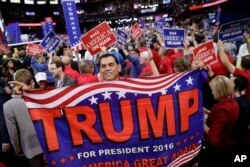 Alaska delegate Saul Soltero waves a Trump flag during the final day of the Republican National Convention in Cleveland, July 21, 2016. The American University professor says Trump has been able to get away with some of his “loose and dangerous” comments on foreign leaders and immigration until now, but those very same statements will be used against him in Democratic advertising and campaigning in the weeks leading up to the November 8 election. “He has not gotten the scrutiny that you are going to get between September and November when the race focuses and sharpens,” Lichtman says. Others not only doubt he will change course, but say he has no choice but to double down. “He's going to unfortunately have to exploit the racial and ethnic fear, discontent issues that have brought him to the Republican nomination,” says Stephen Wayne, a Georgetown University professor. Wayne, author of The Road to the White House, says Trump has to cut into the demographic advantage the Democrats have in a national election, and inspire his base of largely white working-class voters. 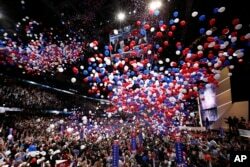 Confetti and balloons fall during celebrations after Donald Trump's acceptance speech on the final day of the Republican National Convention in Cleveland, July 21, 2016. A June 20 poll conducted by Monmouth University shows Clinton winning the minority (African-American, Hispanic and Asian) vote by 72 percent to Trump’s 17 percent. In contrast, the Republican candidate led Clinton among white voters 49 to 38 percent. “Donald Trump faces a strong, unified vote of minority groups against him, so he has got to dig into the white, blue collar Democratic vote primarily in the Midwestern states,” notes Wayne. Solidifying his base is one challenge. Political scientists say Trump’s main task between now and the election is to unite the Republican Party behind him. “There are a lot of ways that this election would favor Trump, but right now Clinton is benefiting in the polls from greater unity on the Democratic side and a Republican Party that is pretty close to civil war,” says Jeffrey Anderson, senior fellow at the Hudson Institute. Trump’s vice president pick, Indiana Governor Mike Pence, will help bridge the gap with conservatives and members of the Christian right in the Republican Party, says AEI’s Bowman. 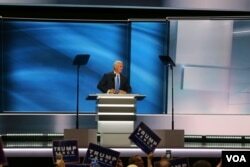 Mike Pence delivers his acceptance speech to be the Republican Party's vice presidential nominee, in Cleveland, July 20, 2016. Going forward, analysts say Trump should shift his campaign to make it less about himself and more about the issues Americans care about, which will likely become more of an imperative during debates with Clinton. The Republican candidate must also focus on the day-to-day of running a traditional campaign. “To a large extent, it’s a question of whether he can continue to put together an actual full fledged campaign with fundraising and ad buying and grassroots get-out-the-vote efforts,” Anderson notes. Clinton has the lead in fundraising so far, with her campaign entering June with $42 million in the bank versus Trump’s $20 million. “Trump really needs to show that he is a credible and disciplined presidential candidate, capable of raising substantial sums of money, capable of organizing a real campaign,” Lichtman says. The Hudson Institute's Anderson says Trump will likely be a force to be reckoned with once he gets more organized and focused. "If Trump can get his campaign operation humming along a bit, Clinton will be forced to sit and play defense," he notes. How Did Trump Get Here?